No matter what you call them—blueprints, bluelines, blacklines, construction documents, plans, or digital prints—we’ve been reproducing them for decades. Our reproductions are accurate and consistent; we make sure the line weights on your hard copies come out as intended every time. Your sheets are always delivered in the correct order, thereby eliminating any possible confusion. 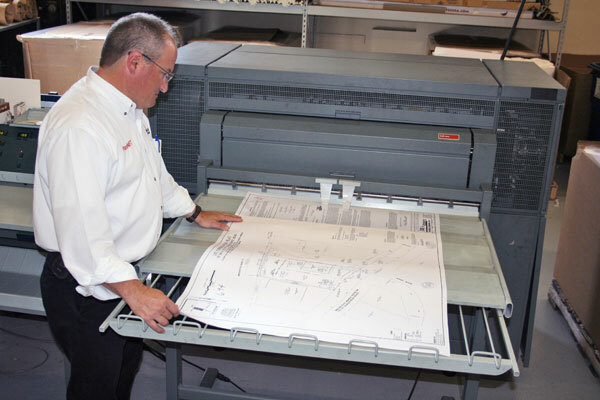 Our large format digital printing equipment can print your blueprints or bluelines from either hard copy or digital files at any size from 12″ x 18″ up to 36″ x 48″. I have been working with printers for the past 15 years and would highly recommend County Blue. They are extremely professional and very willing to go the extra mile. From large format printing to posters and anything in between top notch quality. I would like to personally like to thank their entire team for there hard work and dependability because they always come through on time every time! Small format specification books, training manuals, or any other document can be printed at sizes from 8.5″ x 11″ up to 11″ x 17″, and finished with your choice of bindings. Our large format digital printing technology achieves on-demand printing and short turnaround times—just send your files electronically or bring them to our location on a disk. The specialists at County Blue will reproduce your blueprints or other construction documents quickly and correctly. They will advise you on design and sizing options, and work with you to determine the best paper, cover, and binding for your project. Alternatively, we will scan your hard copies and then email the files to your office. This will allow you to manage your construction plans electronically, make any adjustments, and easily distribute them to the appropriate participants. In the 90 years since County Blue Reprographics first opened its doors, many things have changed, including the very name of our industry. However, one thing has remained the same: the need for large format black and white documents for construction and building projects. That’s why no matter what you ask for, we’ll always know what you want…Copies!